I’m trying something new. 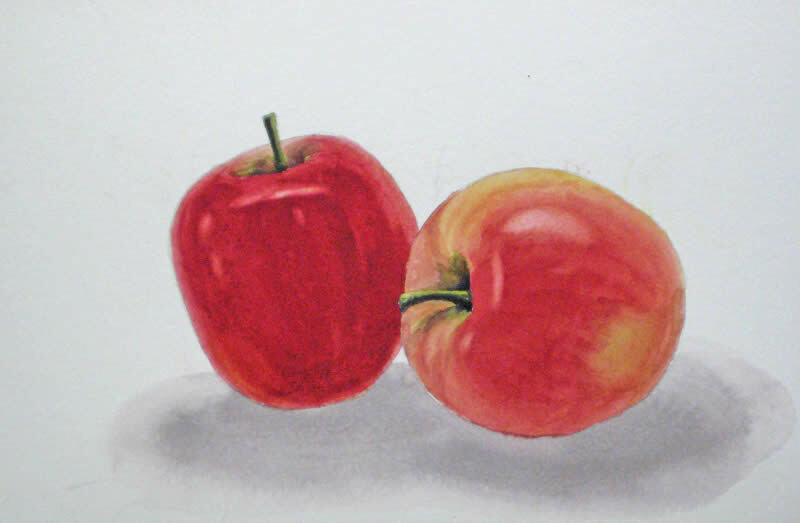 I’ll post a series of free watercolor demos I use to teach a class of beginners. 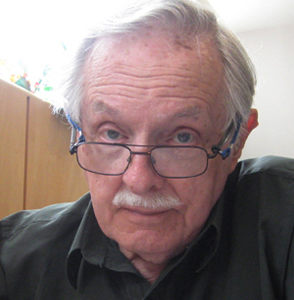 I photograph each stage and e-mail the appropriate images to my students prior to each class. Here is our reference photograph in a high key to avoid background washes which sometimes poses a challenge to beginners. The first step was to get the image on paper. Because none of my students had any drawing experience I got them going right away by supplying them with a full-sized B&W image for tracing purposes and a sheet of transfer paper. They then re-drew this with a 5H pencil to keep a faint but clear image. I’ll be incorporating drawing lessons for them as we go, but I feel it’s important to get people motivated by concentrating on painting techniques and early results. We live in an age of instant gratification and I find that beginners get quickly motivated and stay that way once they amaze themselves with what they can do without spending weeks learning how to draw. 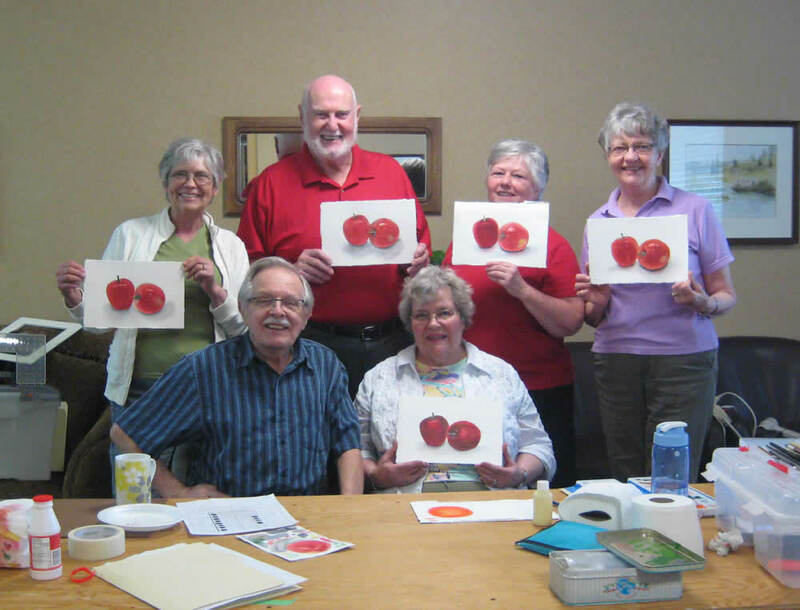 I also introduced them to the techniques of masking by having them protect the stems with liquid misket as a learning experience. Using these step-by-step images displayed on my laptop computer I re-painted this project along with my students, who watched me do each step and then tried the same on their own paper. We began with a wash of Aureolin yellow with a touch of Brown Madder. It soon became apparent why the stems needed protecting in a realistic painting this sort.. I encouraged my students to experiment on a piece of scrap paper before we put any actual colour on their finished project. Here’s how we did that, and it gave me the opportunity to show how we would “lift” the highlights later, rather than have stark white by using liquid misket. 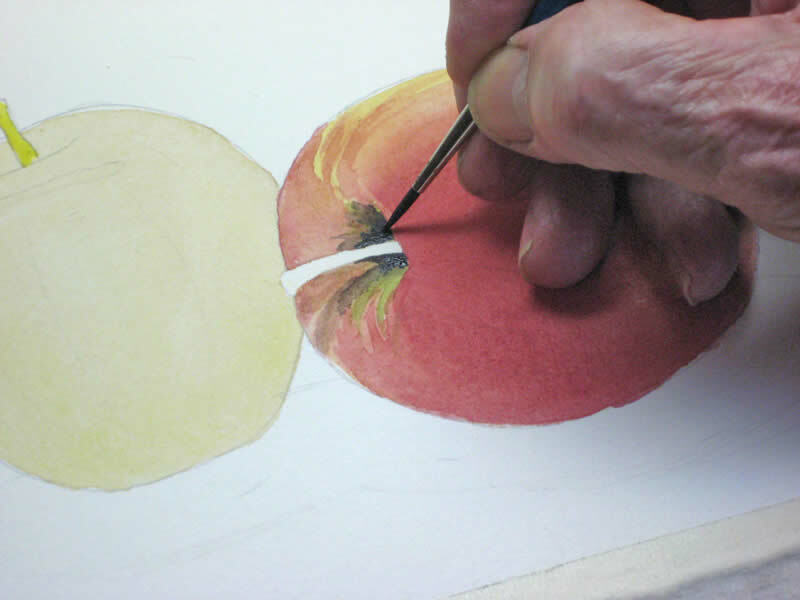 We began by applying a wash of Alizarin Crimson with a touch of Brown Madder, and I used the brush to follow the contour of the apple (see also Image 12). The I lifted out a highlight to reveal the yellow wash underneath. I added another layer of our AC and BM and began work on the stem area. Now for the next apple. 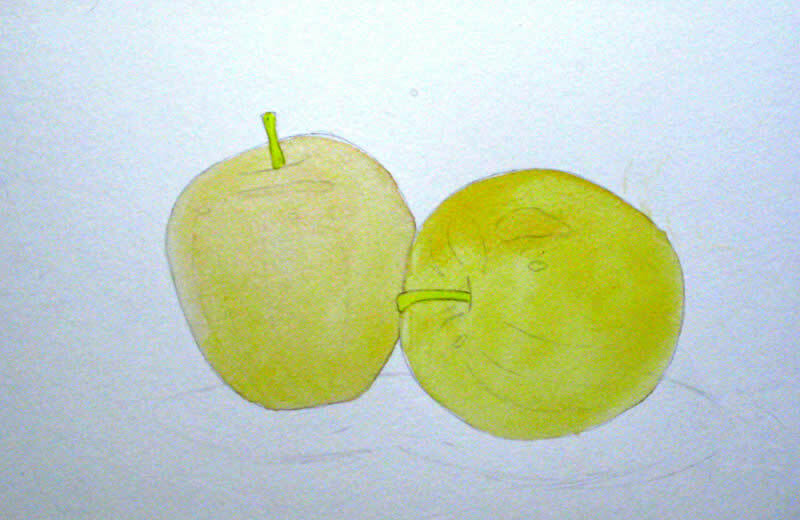 I hasten to add this is not the only way for beginners to paint apples. Some people may wish to keep all aspects of the painting going at the same time and not concentrate as I have, but some beginners find this intimidating and feel more comfortable solving problems as they go. Because my beginners class had a limited experience of brush control I decided we needed to protect the outer edge of the RH apple in order not to lose the sharp distinction between the two. 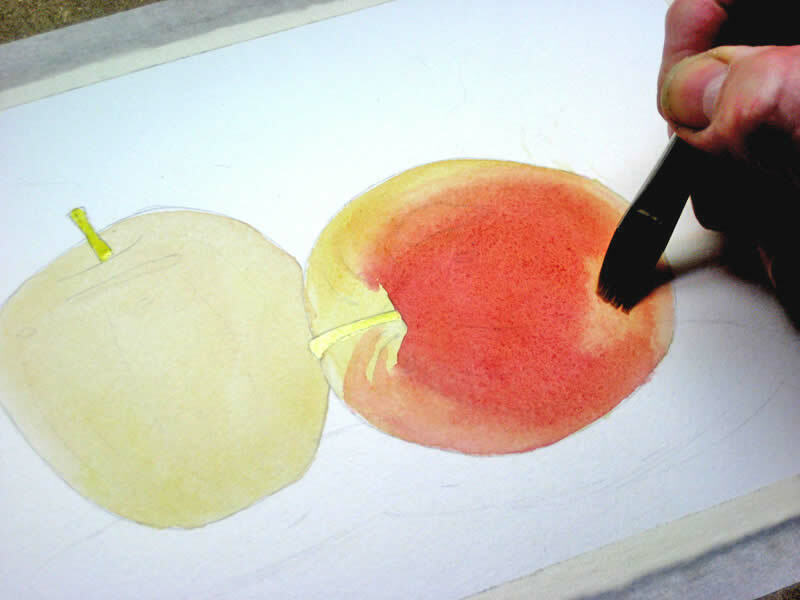 Here I’m showing how to use the end of a small brush to save your liquid misket brushes for finer work. 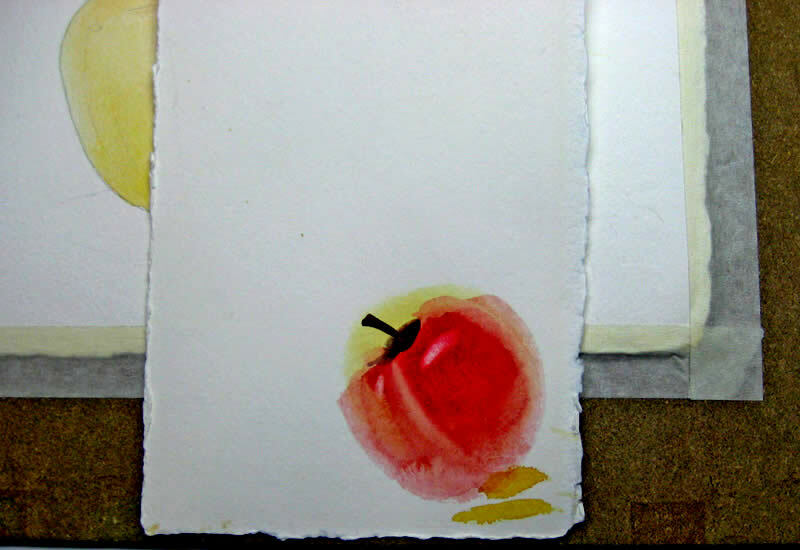 I used the same basic wash of Alizarin Crimson with a touch of Brown Madder to put in the first wash on the second apple. I left some reflected light on the LH side. 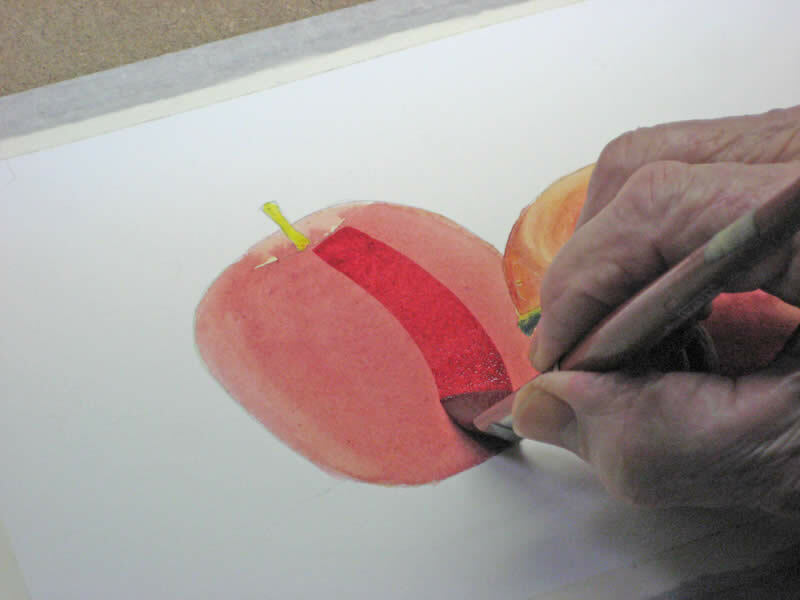 Here I’ve shown how the next layer of wash goes on conforming to the contours of the apple. I was unable to photograph each step of this as I had to blend the edges quickly so they didn’t dry out. 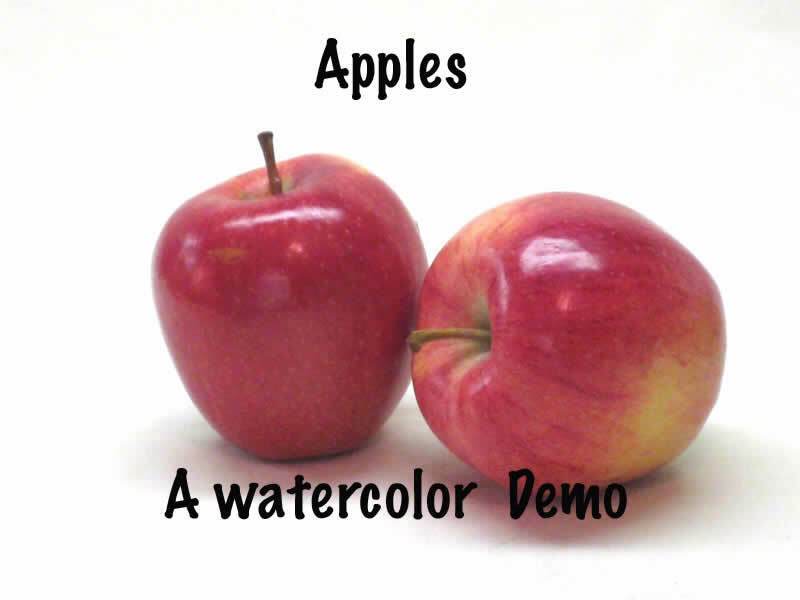 During my actual demonstration I was able to show how manipulating the colour helps to define the apple’s shape. Any accidental brush strokes which showed through helped to define the shape. 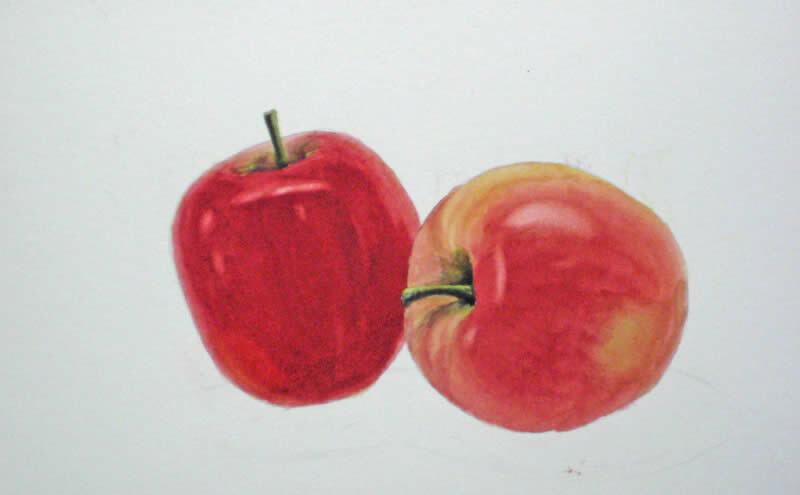 After applying two more bacic colour washes with some lifting to represent reflected light, I used the same technique to lift out the highlights on the LH apples and paint in the stem after removing the protective liquid misket. I then removed the protective liquid misket from the RH apple to clearly show the separation of the two apples. 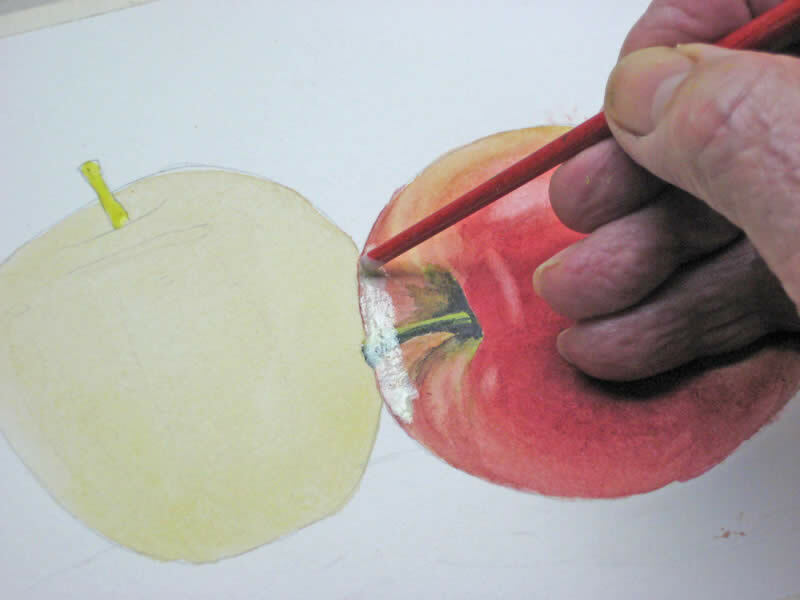 This was helpful for my class of beginners who had yet to master the dexterity required to quickly paint in the LH apple washes and avoid running over into the RH image. As I’ve explained, I did not want my beginners to have to cope with a background wash at this stage, so I set up a high intensity photograph with simple shadows to anchor the apples to the base. The shadows caused us all some grief and I had to admit my demo shadows were far from perfect, but it made my students realize even the most experienced among us come a cropper once in a while. Here is the first wash using wet-in-wet to blend the edges. We used a mixture of Antwerp Blue and Brown madder to give is a cool gray. The next step got a little muddy and had to be blended with later stages. 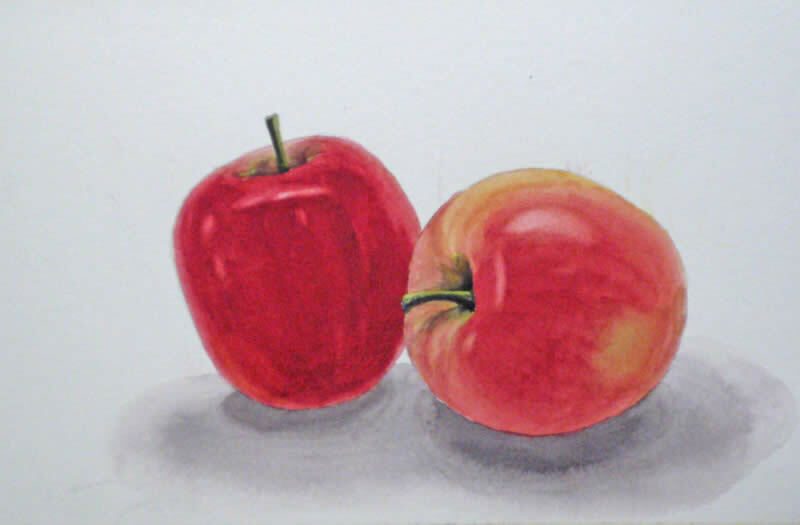 Using a bit of a disaster as a learning experience I quickly put in the final darkened shadow under the apples and blended the whole with clear water and a 1/2″ square brush into a smoother graduated shadow. Here’s the finished project in its mat. I’m still not happy with the shadows, but as my students learned – sometimes you just have to quit while you’re more or less ahead! Here is our group with their finished project, and I think they were all pleased with what they did. 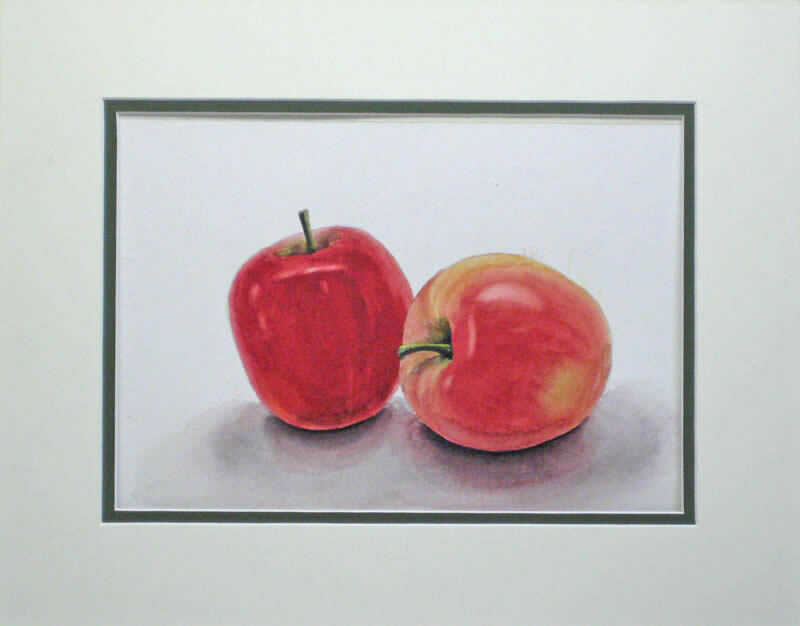 I hope this watercolor demo was of some use to you. I’ll post others in the weeks ahead. 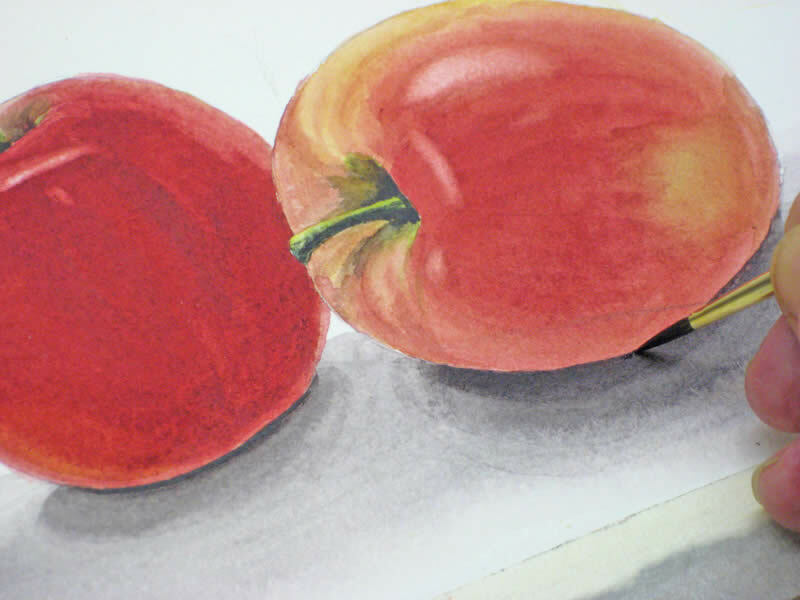 I hope you enjoyed this lesson on how to paint an apple with watercolor. This is a wonderful demonstration, very clear and easy to follow. I look forward to seeing the rest of the class. Thanks for posting and sharing it. My mother is English, Grand dad painted for Wonder Brother advertising. 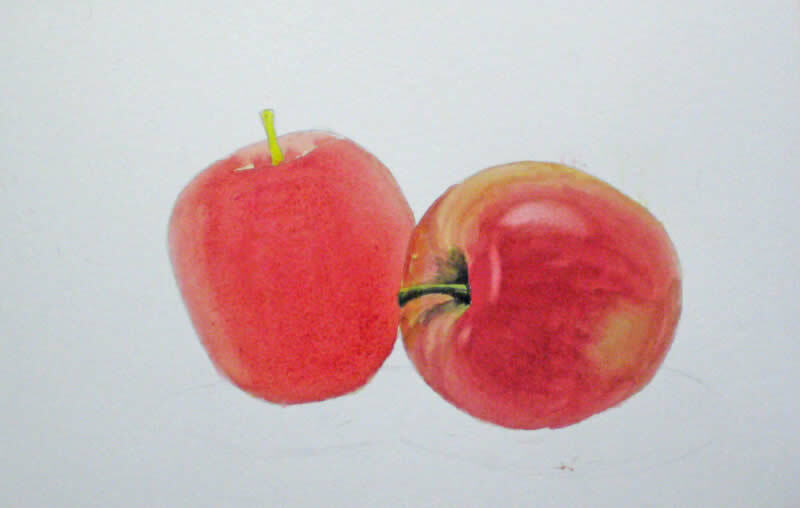 What combination of colors to develop the shade color on the apple did you use. 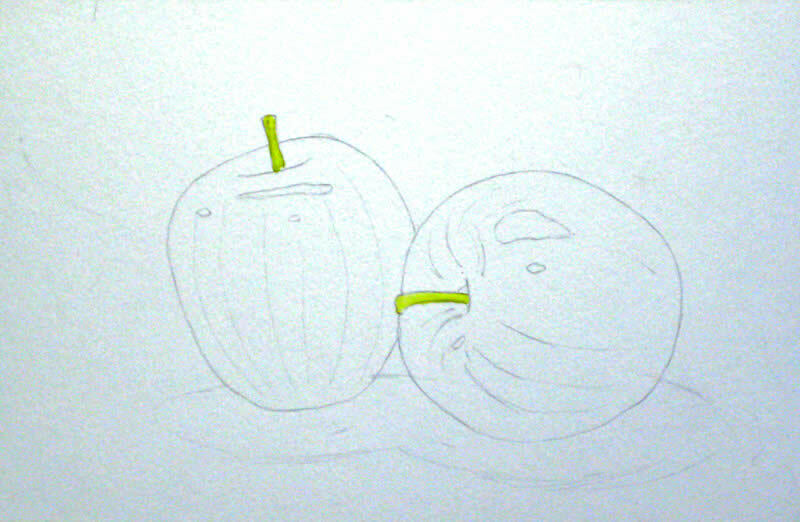 Due you use white watercolor on this apple design? The reason you have multiple layer on the apple is to develop depth. Great demo! Easy to follow. I look forward to many more. excellent demo. 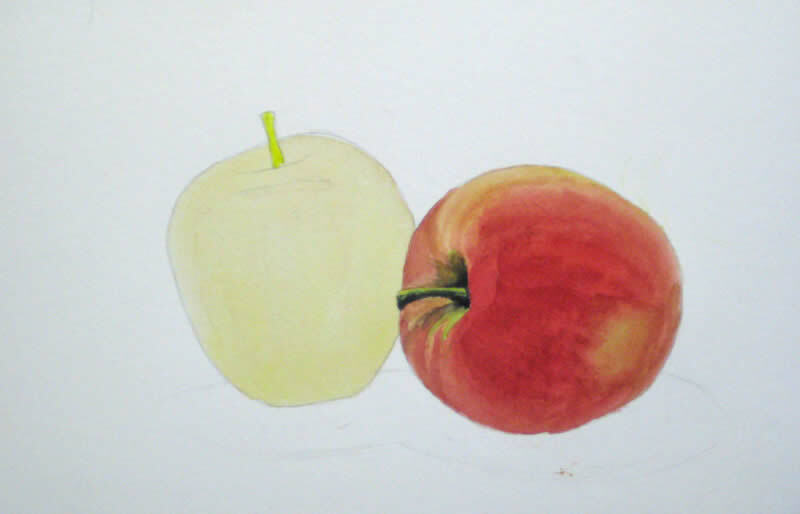 i’m a beginner and find watercolor very difficult but not impossible to learn with your demo I learned how to paint an apple. send more demos please. Very insiteful. Thank you. What is the brand name of the colors you used? Thanks for the wonderful demonstration. I got iced in on Wed. norming and couldn’t get down the stairs or up the driveway. Unless there is another blizzard, I’m really looking forward to being there next Wed.
P. S. I went to Mary Ann’s art opening. It was really interesting to see the works of several artists. I was right about which ones were Mary Ann’s, except for one!